Lima, Peru: The tale of Pepe, a spider monkey rescued from a circus in world-famous holiday destination Cusco, by London-based Animal Defenders International (ADI) has gripped animal lovers around the world. The intelligent, playful monkey had been kept alone and chained by the neck for eight years. The circus had snapped off Pepe’s canine teeth so that he could not defend himself, and the world’s leading veterinary dentist had to be flown in to repair the damage. Now, in the most moving chapter of his story so far, Pepe has finally been reunited with his own kind. ADI has been assisting the Peruvian authorities to enforce their ban on the use of wild animals in circuses, as well as with the relocation of animals seized from the illegal pet trade – a mission called Operation Spirit of Freedom. 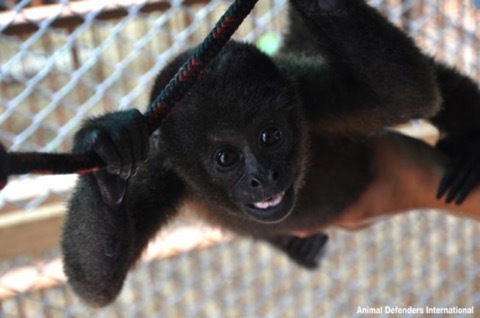 In January, the ADI rescue centre outside Lima received Valerie, a young, illegally-trafficked spider monkey who was being used for entertainment in a restaurant. ADI has a temporary rescue centre just outside Lima, with a full time veterinary team acting as a hub for Operation Spirit of Freedom in Peru. 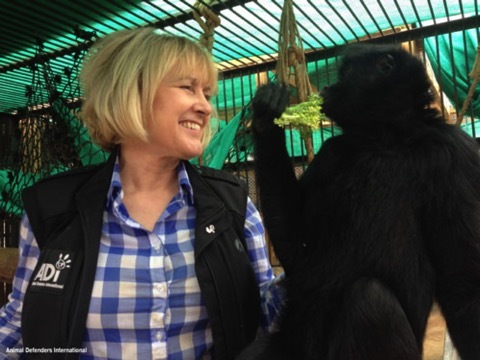 ADI is caring for 21 lions and over 20 other native wild animals there – mainly monkeys. ADI will be relocating all of the animals to permanent homes in the next two months including flying the 21 lions plus 9 other lions from Colombia, to a sanctuary in Colorado, USA. As part of the rehabilitation programme, ADI experts assess the individual animals and form family groups so they can be rehomed together. Prior to their emotional union, Pepe and Valerie had reached out to each other and held hands through the bars of their neighbouring enclosures. Then under the watchful eyes of the ADI team, the two monkeys were allowed to meet. All of the native wildlife rescued during ADI’s Operation Spirit of Freedom, including Pepe and Valerie, will be relocated to sanctuaries in Peru’s Amazon forests but ADI must first construct the jungle habitats that will be their homes.